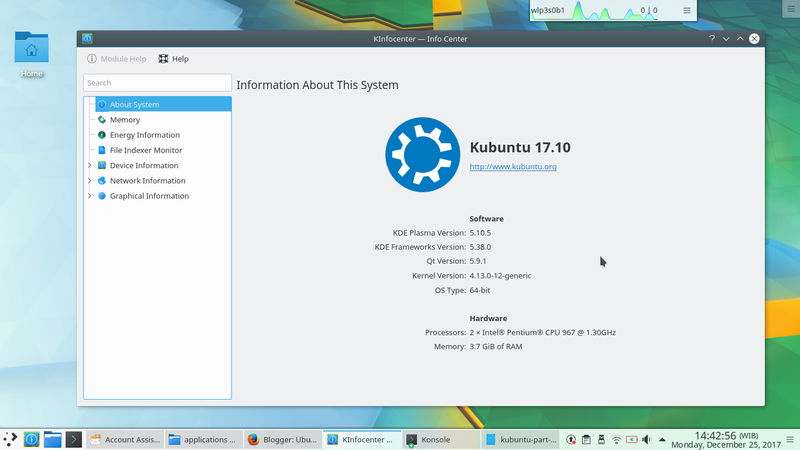 This is the Part 1 of the newbie's guide for Kubuntu 17.10 the series. 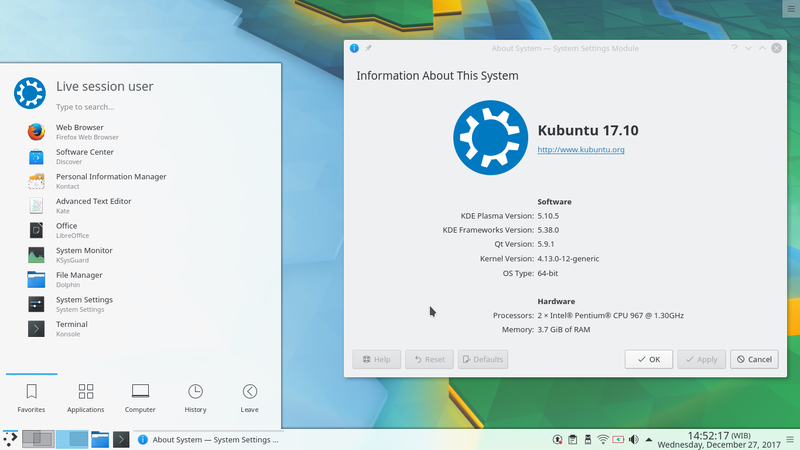 This guide is for new comers --who switch from MS Windows or macOS-- and first-timers in using Kubuntu GNU/Linux in general. In this tutorial Part 1, you will get the intro to icons (applications) at Kubuntu Desktop so you know what program to do what job and get accustomed to them quickly. You will also see the 3 important programs universally used on another OSes which are System Settings, System Info, and File Manager. Happy learning! This series is a companion to our guide for Ubuntu 17.10 (GNOME). Kubuntu is an iconic, desktop operating system, visually very similar to MS Windows and Apple macOS. 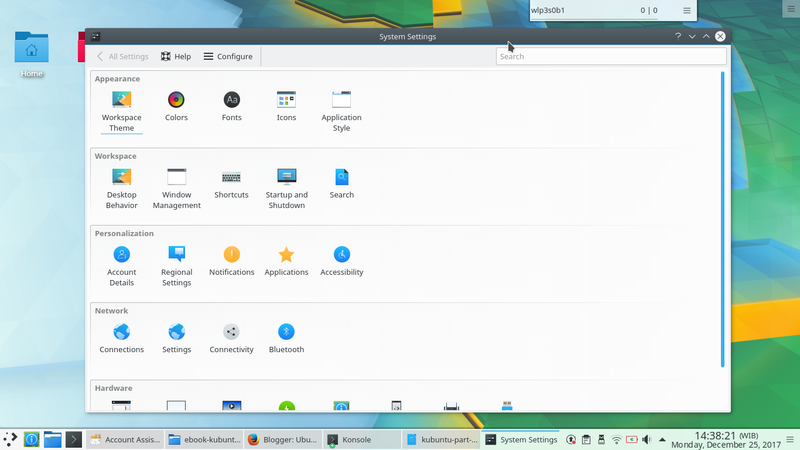 By iconic it means you work with Kubuntu by clicking icons, you recognize desktop functionalities by their icons, you run applications by clicking their icons, you put icons at desktop area, you put icons at panel, like that. 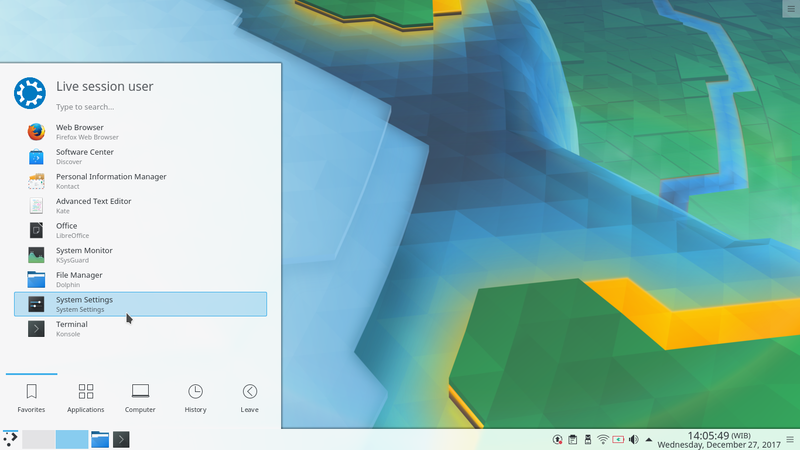 If you work previously at MS Windows with those same visual experiences, you will be happy with Kubuntu. So this is a table that introduce icons (applications), names, and their functions at Kubuntu. Gwenview Picture viewer. Similar to ACDSee at MS Windows and iPhoto at macOS. Word processor. Similar to MS Word. LibreOffice Calc Spreadsheet. Similar to MS Excel. LibreOffice Impress Presentation. Similar to MS PowerPoint. Dolphin File manager. 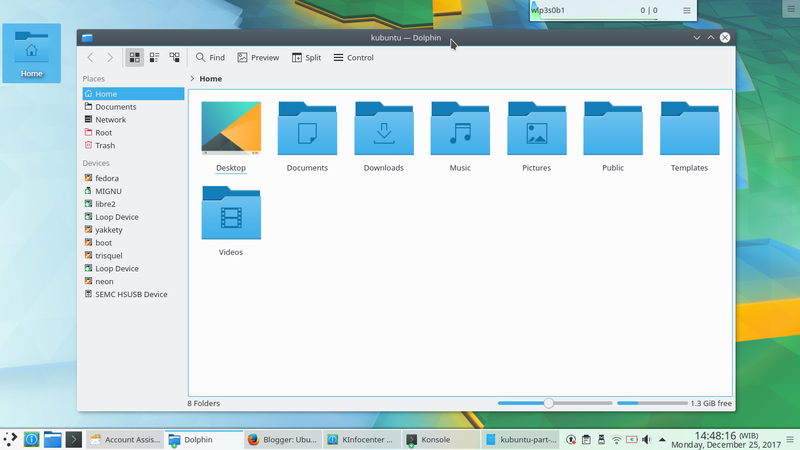 The place to access folders, files, and partitions. Similar to Explorer at MS Windows and Finder at macOS. Ark Archive manager, the program to extract or make .zip and such files. Similar to WinZip at MS Windows. KDE System Settings Control panel. VLC Media Player Video and audio player. K3B DVD and CD burner. Similar to Nero Burning ROM on MS Windows. Discover Software center. Similar to Play Store on Android, or App Store at macOS. KOrganizer Calendar, scheduling, event arrangement, automatic reminder, and TODO task manager. KMail Email client. Similar to MS Outlook at Windows. Kate Text editor. Similar to Notepad at MS Windows, also similar to Notepad++ and Sublime Text for programming. KSysGuard System monitor, CPU and memory usage displayer. Similar to Task Manager at MS Windows and Activity Monitor at macOS. KInfoCenter System info and device manager. KTorrent Download manager that is very fast and special for huge files. It’s a replacement for uTorrent at MS Windows. This part introduces 3 important programs you should know first at Kubuntu just as you've been familiar with at another OSes. You need to know System Settings, KInfoCenter, and File Manager, where to find them, and what you can do with them. It's the replacement for Control Panel (if you were MS Windows user) or System Preferences (if you were macOS user). You can find it from desktop menu by typing "system settings" there and click the icon to run it. It's the Hardware Info of Kubuntu. You can think this as DXDiag + Device Manager at MS Windows, where you can see a summary of system (OS version, memory capacity, drivers, etc. ), the CPU & VGA details, and many more hardware-related info. Dolphin is its name. It's the same as Explorer (if you were Windows user) or Finder (if you were macOS user) that is a place where you access your files, folders, partitions, USB flash drives, and any external disk drives. Dolphin will be your best friend everyday with Kubuntu.